Well we’ve introduced the two most important aspects of composition, balance and flow, what next. Well, we could talk about these two alone for quite a while - the idiosyncracies of each of these will be part of our discussions in future episodes. 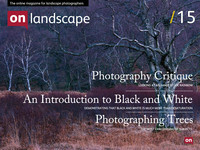 In this issue I’d like to talk a little about taking photographs in woodland, of trees and shrubs and other complex subjects. A lot is talked about the difficulties in composing in woodland and distilling the natural chaos and I hope I can pass on a few techniques for simplifying things. I’ll start with an obvious one for many of you but it bears repeating. When you are wandering around the woods, you are seeing in three dimensions. When you take a photograph, you are seeing in two dimensions. Very often you will see a view that works really well with leading lines and background/foreground but you need to be really wary that this view doesn’t rely on depth perception in order to work.